Not only is it an all-around great holiday, but tomorrow marks my 32nd year on this planet. Whenever I have to show my ID to anyone and they see that my birthday is on Halloween, they frequently ask me if I enjoy having a holiday birthday. My answer? Absolutely. I had some great birthday parties as a kid! I know I mentioned this in a previous blog post, but I seriously can't get enough of the delicious homemade bread we've been eating for the past week or so. YUM. Plus, in keeping with the spirit of Halloween, I made scrumptious pumpkin bread the other day. My friend Justine got me hooked on this admittedly bizarre group when I was in college. I was a bit skeptical at first, but their use of classical instruments naturally appealed to my classical violin major self. Creepy, unconventional music? You bet. 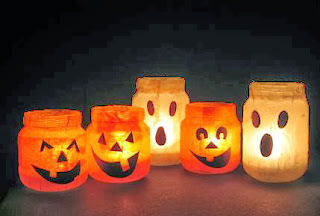 Perfect for Halloween? Without a doubt. Our Halloween candy stash. I'm excited to finally break it out tomorrow. (If you look closely, you can see that it's ever so carefully hidden away in a cupboard. Some of you may assume I'm keeping it from my 2-year old. You would be wrong. I'm hiding it from my husband). Last year, I made the mistake of buying Halloween candy a week in advance, and Will ate almost an entire bag. Seeing my babies in their costumes tomorrow! (Sorry, I don't have a picture yet, for obvious reasons). Tony will be trick-or-treating at Big Boy School tomorrow morning, and then as soon as Will gets home from lab we're going to take our little train conductor and bumble bee around the neighborhood. For more Favorites, visit Hallie at Moxie Wife. Happy birthday to my best helper-I love you sooo much! You're my best mama!! And thank you! October birthdays rock -- but I'm jealous that yours is on the 31st. 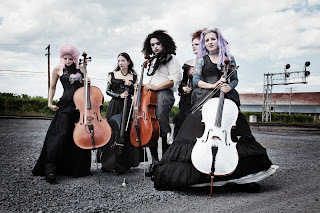 How cool-it's not often I come across people who are familiar with Rasputina!